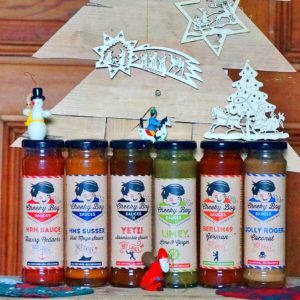 Cheeky Boy Sauces 3 Pack Explorer Range. Ingredients: Tomato, Brown Sugar, Celery (9%), Worcester Sauce (malt vinegar, spirit vinegar, molasses, sugar, salt, anchovies, tamarind, onion, garlic, spice, flavourings) (Barley, Fish), Onion Powder, Spices (2%) (Mustard), Salt, Smoked Water. Allergens in bold. Ingredients: Ginger (38%), Rapeseed Oil, Coconut Milk Powder (14%) (coconut, maltodextrin, milk protein) (Milk), Demerara Sugar, Water, Garlic, Salt, Spices (1.4%), (Preservative) Potassium Sorbate. Allergens in bold. No Artificial Flavours. No Artificial Colours. Meat Free. Gluten Free. Ingredients: Passata (59%), Ginger, Honey, Tomato Puree (10%), Birds Eye Chilli (1%), Spices (1%).